Hopefully you are and that you are taking a few moments to relax after an awesome holiday weekend and before you begin your next work week. 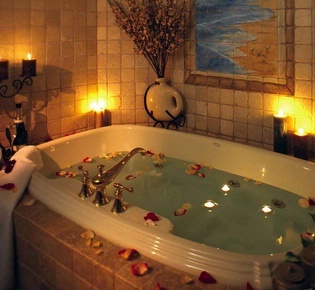 I hope the picture above inspires you to pause and say YES that looks like a great idea and you shut the door and run some water and light a few candles and just ease into that water and let out a big sigh of relaxation. But how about something to add to your bath to make it even better? Epsom Salt is a wonderful addition to any relaxing bath but did you know that this is not really a salt but actually a mineral compound ~ magnesium sulfate? These minerals have been shown to be easily absorbed into the body through the skin making a bath soak an ideal way to reap the benefits of these minerals. Magnesium has been known to reduce inflammation and in that way improve muscle function. Sulfates help flush toxins and improve absorption of nutrients. Both these minerals can add a lot of physical benefits to your soaking time in the tub. Epsom Salts can be purchased bulk through your pharmacy or you can try our scented soaking salts online here . We have Lavender and Sore Muscle Soaking Salts. Epsom sale is the best! I drop a few drops of Lavender essential oil into the mix and it’s perfect! It isn’t it! So great after a stressful day!